House of Graff, the producer of the most fabulous diamond jewelry in the world, has been fittingly known for their celebrated stones with outstanding properties - brilliant, rare, and exceptionally crafted. Graff's notable clients comprise of the usual rich and famous - world's royalty, heads of state, and Hollywood stars. It has received numerous accolades, including the Queen's Award, one of the most prestigious awards given to an enterprise. As most of us know, a diamond's structure, hardness, brilliance and brightness are unrivaled by any other stone known to man because it was formed millions of years ago in the earth's core and it was able to withstand the very long journey to this day. That is the reason why these stones are of such high value. Below are some facts about the House of Graff and information about their exquisite diamonds. - Laurence Graff - founder of the House of Graff, also hailed as the 'King of Diamonds'. The jewelry house's own history, which goes back to over three brilliant decades, is just as fascinating as its diamonds. - The Lesotho Promise - of exceptional color - rated D, the top color for diamonds, this 603-carat stone was discovered at the Letseng Diamond Mine in the Maluti Mountains of Mokhotlong district, North of Lesotho, a kingdom surrounded by South Africa. It is said to be the biggest diamond found in 13 years, and was bought by Graff for a whopping $12 million! The stone went under the hammer at the Antwerp diamond center and are now being studied by Graff's experts. It will take at least a year before it will be cut and polished into brilliant diamonds. It ranks as the 10th largest white diamond ever found. - The Graff Vivid Yellow - Discovered as an exceptional rough crystal of 190.72 carats, this stunning rock was of such exceptional color that it had to be sent to the Gemological Institute of America (GIA) to verify if it was entirely natural. 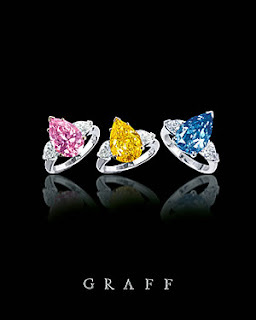 The challenge for Graff was to preserve the splendid color with a magical weight of 100 carats. It had to undergo a rigorous process lasting over 9 months in which the 190.72 carat rough crystal was expertly transformed into a magnificent polished diamond of 100.09 carats of startling, vivid beauty. - The Paragon - Sourced from an isolated region in Brazil, this rough diamond of 320 carats took endless months of work before its full glory was finally revealed. A perfect cut and flawless quality has endowed this 137.82 carat diamond with a startling brilliance. It has been certified as a "D color and internally flawless' stone by the GIA, with a statement that it is the largest 'D' flawless diamond they had ever graded. - The Star of Lesotho - Hailed as the 'Most dazzling 'D' color heart shape diamond', it weighs 53.11 carats and was recently sold by Graff. It was 123 carats in the rough, when it was discovered in the Letseng diamond mine in the Maluti Mountains of Mokhotlong district, north of Lesotho. The painstaking process of cutting and polishing this stone was undertaken by a team of Graff's experts at its factory in Antwerp. - The Golden Star - Weighing over 101 carats, this fancy, vivid yellow, cushion-cut diamond was an astonishing 204 carats in the rough when discovered in the famous Finsch Mine located in the Northern Cape in South Africa. The cutting and polishing was done partly in the Graff factory in Johannesburg and thereafter entrusted to skilled master cutter at the Graff workshop in New York. - The Graff Legacy - As a vertically integrated company, Graff directly sources diamonds from mines across the world, after which its skilled workers expertly cut and polish the precious stones at its famed workshops. Selecting only the finest and most superior stones, Graff executes lavish, extraordinary jewelry collections that one can cherish for a lifetime and pass on to the next generation. - Each of Graff's diamonds is laser inscribed on the girdle with the Graff logo and GIA identification number, an inscription visible, only under 10 point magnification. Every diamond over one carat is accompanied by a GIA certificate verifying its cut, clarity, color and carat. Discover the compelling power of Graff's creations at Graff showrooms conveniently located in Burj Al Arab, Saks Fifth Avenue - Burjuman Centre and Wafi City. 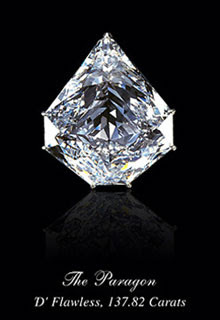 See the finest and most exquisite array of the earth's most enduring and valuable stones - DIAMONDS. And of course, Jewelry Days' website (link below) for various choices of jewelry and accessories. We offer diverse types of stones, may it be our blog's topic which is diamonds, or gemstones such as sapphires, amethyst, ruby, pearls, and more, in yellow, white, or rose gold, platinum, and others. Take a look at your options. Enjoy!